Following the success of the inaugural Festival in May 2017, the John Rae Society held another John Rae Festival from 4th to 6th May 2018. We were thrilled to be joined by Canadian author and Patron of the John Rae Society, Ken McGoogan, whose 2001 book, Fatal Passage, told John Rae’s story in vivid detail and has inspired many who have read it to campaign for better recognition for Dr Rae’s achievements, and to join the John Rae Society. We were delighted with the response to the 2017 Festival and grateful for everyone’s interest and goodwill. Over four hundred people from Orkney, the wider UK, the US, Canada and Germany, attended events, and friendships were formed which have opened up further opportunities to raise awareness of John Rae and the Hall of Clestrain. This year nearly three hundred people came to the events over the weekend. Attendees were a mixture of local folk, visitors on holiday, and John Rae Society members from Orkney and mainland Scotland, some of whom had travelled to Orkney especially for the Festival. On Friday 4th May, we were treated to an evening lecture by Ken McGoogan. Ken is a widely-travelled writer with an award-winning career as a journalist spanning two decades. A long-time literary editor at The Calgary Herald, he has also published three novels and Canada’s Undeclared War, a controversial work of non-fiction. Ken spoke about his research for Fatal Passage, which began twenty years ago with a fellowship to the Scott Polar Research Institute in Cambridge. His travels also took him to Orkney and the Arctic, where he placed a plaque commemorating John Rae’s achievements on the shores of Rae Strait. He gave an overview of John Rae’s story, arguing that Dr Rae solved the two great mysteries of Arctic exploration: the fate of the Franklin expedition, and the final navigable link in the Northwest Passage. Ken brought the audience right up to date with his latest publication, Dead Reckoning: The Untold Story of the Northwest Passage. In this book he charts the history of Arctic exploration from the sixteenth century to the present day, examining well-known figures from the Royal Navy, but also including John Rae, Roald Amundsen, and the huge contribution of the Inuit. Ken had kindly supplied the John Rae Society with a limited number of hardback copies, which sold out that evening. 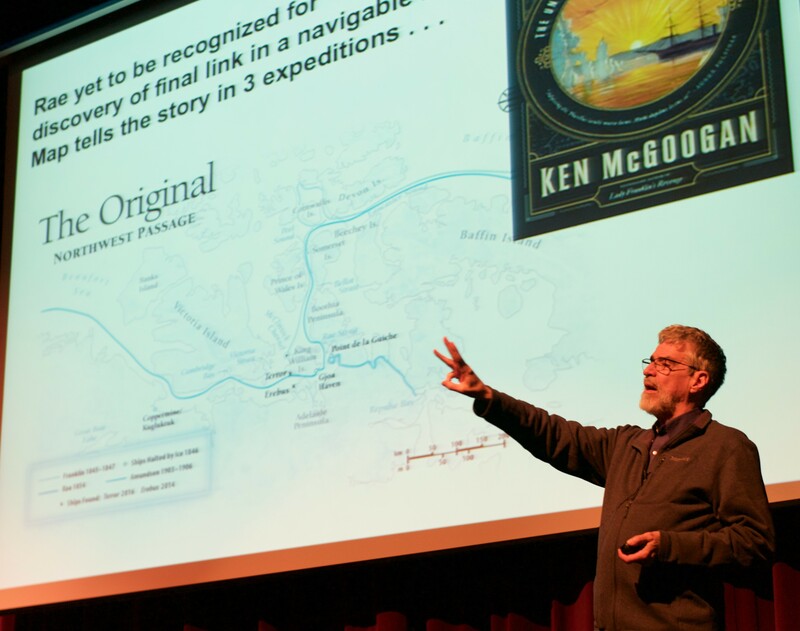 Ken’s lecture ended with a plug for the “next chapter” of the story, an expedition in spring 2019 with Scottish explorer, David Reid, to retrace John Rae’s steps in the Arctic. Find out more at https://www.arcticreturn.com/ and http://kenmcgoogan.blogspot.co.uk/p/home_11.html. On Saturday 5th and Sunday 6th May the John Rae Society held open days at the Hall of Clestrain where visitors were shown around the Hall and were able to hear about our plans for its restoration. Tea, coffee and cake were on offer, and we had support from the Scouts, who gave visitors a friendly welcome and escorted them to the Hall. The wonderful sunshine and heat on Saturday were replaced by cold wind and rain on Sunday, but a good number of intrepid visitors still made their way to the Hall. The final event of the 2018 Festival on Sunday evening was a screening in Stromness Town Hall of John Walker’s 2008 documentary film Passage about John Rae’s search for Franklin. 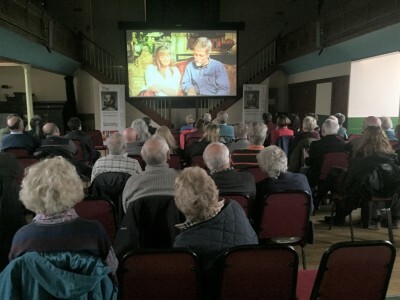 The film is familiar to many in Orkney, and the John Rae Society has shown it twice before, but this time we had an introduction from Ken McGoogan and Tom Muir, both of whom appeared in the film. They also answered questions afterwards and gave fascinating insights into the making of the film. All of the Festival events were free to attend, but audiences were generous with their donations and support of the raffles and lottery. We gained several new members, sold copies of the ever-popular Finding John Rae by Alice Jane Hamilton (our 2017 speaker) and Pemmican by Kjell Lundin, and launched the first products exclusively designed for the John Rae Society by Shetland artist, Gilly Bridle. The John Rae Society is really pleased with the numbers of people who came to Festival and with their enthusiasm. In all, we raised nearly £2000. This is another milestone in our project to restore the Hall of Clestrain and we are planning more events and activities during the summer. We would like to thank Ken and Sheena McGoogan for travelling to Orkney for the Festival weekend, Tom and Rhonda Muir, Ivan and Jean Craigie, Norrie Rendall, John Leith, Anne Lea and the Trustees of the John Rae Society for their tireless support. We would also like to acknowledge the generosity of Orkney Islands Council’s Culture Fund, Paddy Casey, and all those who donated raffle prizes.